This entry was posted on Wednesday, March 27th, 2019 at 5:00 AM and is filed under City government. You can follow any responses to this entry through the RSS 2.0 feed. You can leave a response, or trackback from your own site. 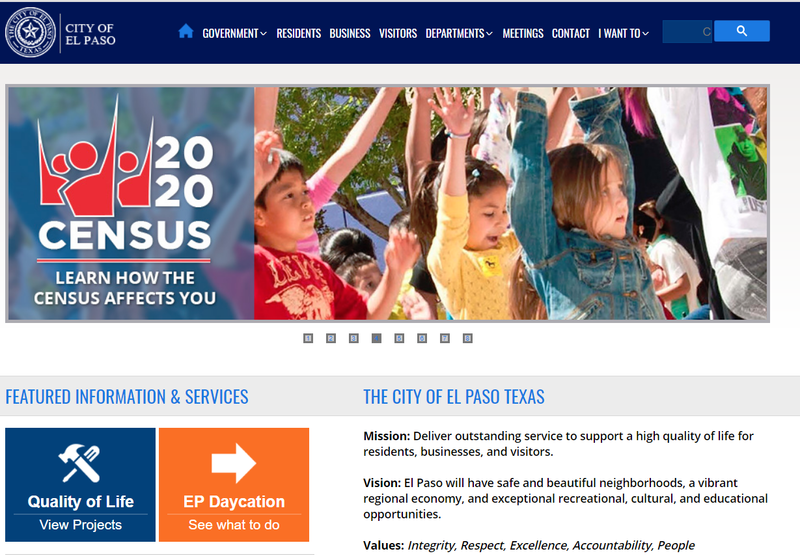 Here is the link http://gis.elpasotexas.gov/cips/ with a side bar listing all the projects. The information conveyed ranges from useful to flim-flam. l must be doing something wrong because l can’t get anything. I just clicked on the link and the page came up…don’t know why it won’t work for you. l clicked on it a second ago and it finally does show the list. I think it speaks to the attitudes of the City leadership. Tommy G came in here promising to add world class process improvement methodologies to our city (the Baldrige award criteria and Six Sigma methodologies all force folks to measure and work toward improvement of everything). The fact that there apparently is no data for this page suggests those methodologies aren’t being applied to measure anything in Q of L (which is one of the city’s largest areas of expense and therefore worthy of progress and cost control measurements). Perhaps they should just print the word SUCKERS!!! on the page in 60 point type. That at least would fulfill their commitment to transparency. Tommy Gonzalez, like Juan Cabrera at EPISD. Both just “Carpet baggers”, passing through our little ol’ town to fleece “US stupid, ignorant peons” and then move on to the next town, fleecing. THEY don’t care that El Taxo is a poor town with no jobs, no money, they are going to take all they can get and RUN. Just like all the politicians here. I thought the mayor was going to ask how much more taxpayers wanted to spend on these issues, since apparently what was voted for was insufficient for the requested work? How does the private sector react when they get a bid for something specific and then are told that the amounts they were told it would cost were unrealistic and that it would cost much more? they cancel projects, that how the private sector deals with deception, misinformation and overpricing. The ONLY “Quality of Life” that “Improves” in El Taxo, is for the politicians, Public Officials and the RICH elite that THEY force US to provide “Stuff” for. The rest of US work, pay taxes, work pay taxes, get a Retirement, Social Security check, pay taxes and wait for their NEXT tax INCREASE. “Quality of Life” in El Taxo, is US “Stupid, ignorant peons” surviving til the NEXT tax INCREASE, for “stuff” THEY want.. Unfortunately, Ray Salazar and Stephanie Townsend Allala warned taxpayers. This is the end result for not getting involved and allowing corrupted politicians to bankrupt our City. It’s also corrupt business people, not just corrupt politicians.